than he can took with his own hands. When the miller has to sharpen the millstones, he takes off the wooden casing. With the crane he can lift the heavy revolving stone, turn it upside down and put it with the grinding side on top next to the lower stone fixed on the floor. 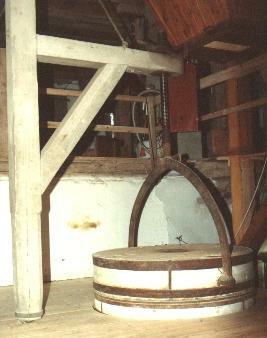 He has good various tools to give the millstone a proper sharpness for crushing the grain.